How to get your audiences to care as much as you do. You can explain your research with publication-worthy panache. So why don’t people outside of your niche seem to get jazzed about your topic? Maybe your presentation is upside down. Spoiler Alert. So what? Share the IT Factor. THIS: McClintock’s discovery of ‘jumping genes’ was one step for a researcher; one giant leap for mankind’s understanding of how genes produce endless varieties of life. o Like red wine but not white? Jumping genes influence grape color and your favorite pairings. o Would you find purple tomatoes palatable? What if they deter cancer? Genes can be made to ‘jump’ to grow these potential life savers. Add details. But do not sling zillions of facts and research references. Maintain the proper level of complexity so your audience stays interested as they cross mental bridges to new understanding. Details need some type of ‘IT factor’ where IT can stand for Interest Traction, Interconnected Topics, or Independent Thinking. • Genes are made of DNA. Genes carry traits from parents to offspring. All living things – including YOU – reproduce thanks to genes. • The proper term for jumping genes is transposons. Transposons move or ‘visit’ other locations in the organism’s genetic material. • Genes jump naturally. Or they can be modified to jump to particular places within the genetic material (a.k.a. ‘genome’}. • When a gene jumps, it leaves behind parts of itself. These little parts make little changes. Little changes can cause a big change in how something looks or behaves. This means there is a change in the organism’s DNA. Such a big change is called a genetic mutation. • Offspring do not look or function precisely like parents partly because ‘jumping genes’ and other types of genetic mutation cause important changes. As the changes add up over time, organisms can take on new forms. Now the stage is set. Your audience should be ready for more interactive discussion or active learning geared to the setting and your audience’s needs and preferences. Your aim is to be engaging and accurate. Engaging 4th graders is different than engaging legislators which is different than engaging reporters. And while accuracy always has parameters, it can be conveyed with vastly different vocabularies. These factors combine to create tone. Figure 2 shows a continuum of tone. Aim for the middle for general audiences. Slide either way to meet your particular audience’s age range and interests. And remember: each audience member is an expert on his or her own experiences, perspectives, and expectations. Respect what every person brings to the conversation. 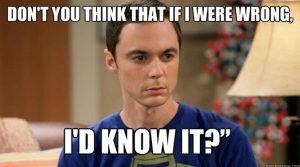 Don’t be a Pontificating Sheldon (Big Bang Theory). What do scientists think about the public and does it matter to their online engagement? Which engagement skills, resources or events have you created or used successfully? Please share ideas and links below.